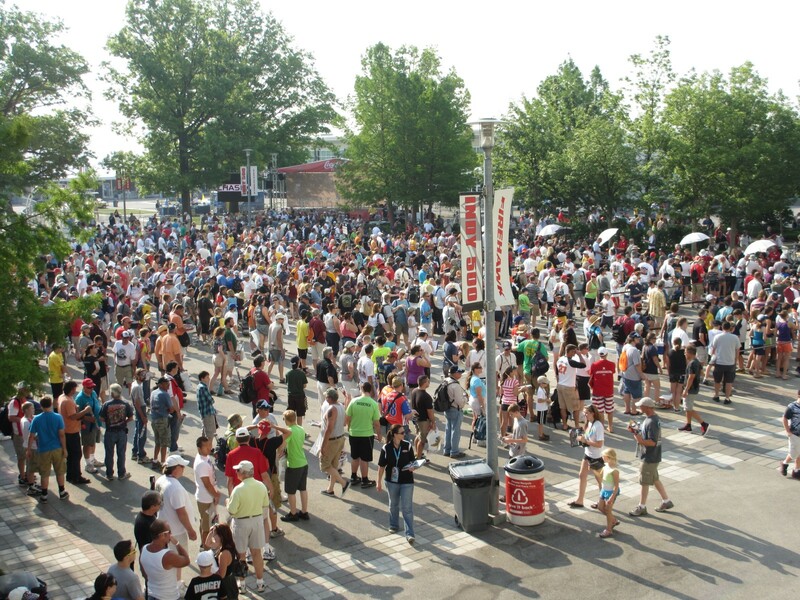 The fans were dedicated Saturday morning at The Brickyard, lining up early in 80 degree heat to get autographs from the 33-driver field for Sunday’s 96th running of the Indianapolis 500 race. There were eleven queues, one for each row of the starting field. For those who didn’t have an article to be signed, there were posters, programs and other handouts. Other scheduled activities included the eight Indy 500 Rookies on the Patio staged, followed by a Patio Q&A with ROGER PENSKE. On the many Media Center monitors are various shots of the track by the TV production crew, getting ready for the Sunday live broadcast. The crew take turns at the various camera locations chalking marks, testing microphones, cameras, cables, etc. The video of JIM NABORS singing the traditional “Back Home In Indiana” is shown over and over, until it’s just right. Health concerns are keeping Nabors in Hawaii, so he’ll be seen in a tropical setting in casual garb. Meanwhile, at IMS, the weather is so muggy and warm, it’s downright tropical. Some of the military musicians are practicing their marching formations, Victory Circle is getting all gussied up and fans were still roaming throughout the track all afternoon. While the drivers were busy signing autographs, AARWBA was holding its Annual Indy Breakfast at The Brickyard Crossing Convention Center. 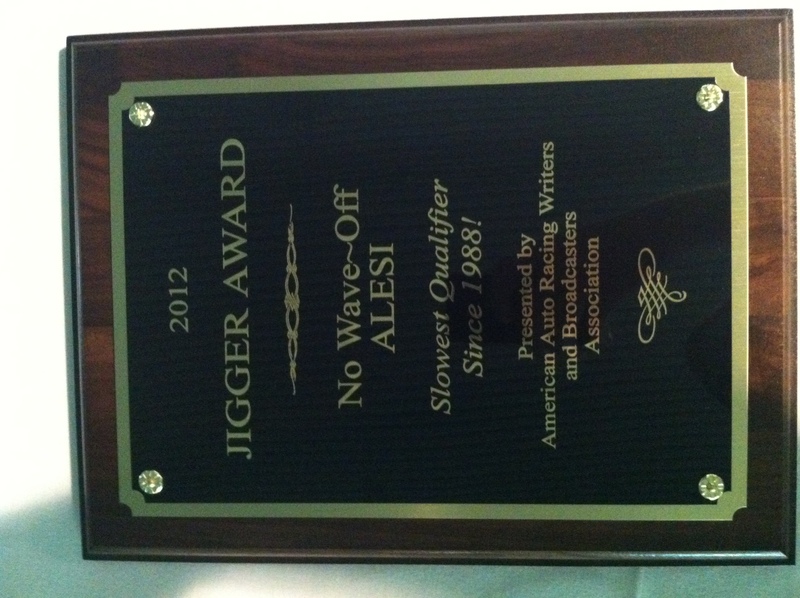 In addition to honoring the achievements of its media members, The American Association of Race Writers & Broadcasters presented The Jigger Award. 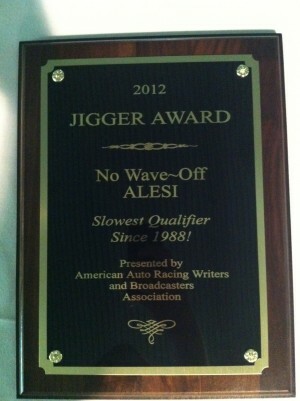 It is a hard-luck award made of a gold-color metal (used) whiskey jigger mounted on a base attached to a plaque. It is named for retired race driver, nicknamed “Jigger.” Leon Duray ‘Jigger’ Sirois comes from Virginia each year to present the award. 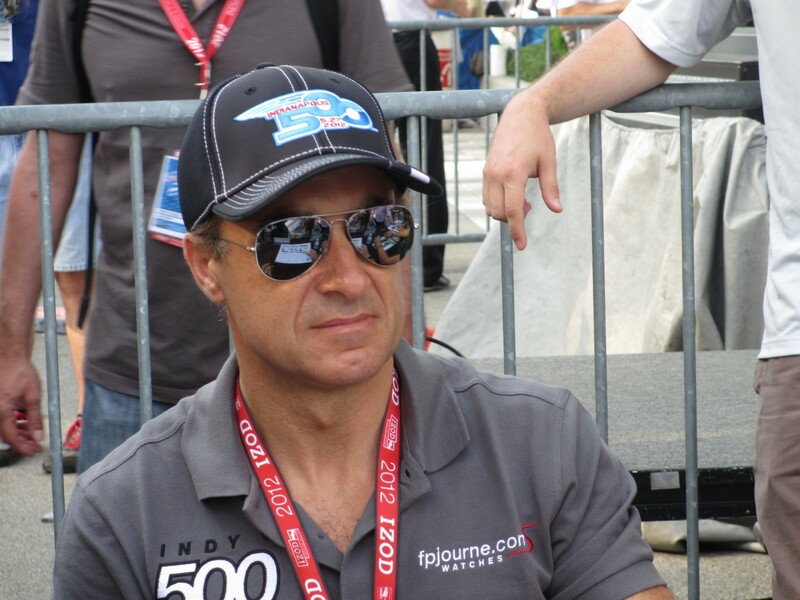 This year’s Jigger Award went to JEAN ALESI, the 47-year old Indy 500 Rookie who qualified last for this year’s race, the slowest qualifier since 1988. He is the oldest ever Rookie for the Indy 500. The award was accepted on his behalf by DAVID BYRD, public relations representative for the Fan Force United team for whom Alesi is driving. Alesi had conflicting obligations Saturday morning – the mandatory Indy 500 Driver Autograph session. Friday night, Alesi attended the annual “Last Row Party,” where he accepted his extra prize money of 33 cents for being the 33rd and final starter in the Indy 500 field. He took all the good-natured ribbing and mild roasting in stride, with a wink and a smile – so said Byrd. Sirois was the only driver to attempt qualification on a weather-plagued first weekend of the 1969 time trials. His crew waved off his attempt after he recorded his first three laps at 161, 162, and 160. Had he completed his final lap at a speed in the 160-mph bracket or above, Jigger’s average would have been above that of the slowest car in the 33-car starting field – the 160.851 MPH of Peter Revson. That would seem to have put Sirois starting on the pole with the slowest speed in the 33-car field. Donald Davidson, noted Indy 500 race historian, says the pole car can indeed be bumped, when on the ‘bubble’, if it has the slowest speed in the 33-car field. This entry was posted in IndyCar by Lynne Huntting. Bookmark the permalink.